Attending a convention soon? Maybe it’s your second or third time around and you really want to make a new impression. You’ve found your identity and how you want to present yourself, but you’re still trying to figure out the perfect way execute it. 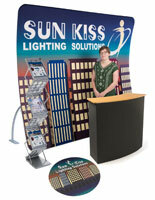 Our budget conscious trade show booths are a cost-friendly, all-in-one solution to your next convention. We have kits with everything you need to make a lasting impression on attendees, all while staying under $2,000! 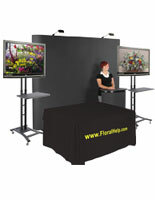 These cost-friendly trade show booths contain necessities like backdrops, counters, or TV mounts. All of these are portable — which is an essential feature of convention equipment. 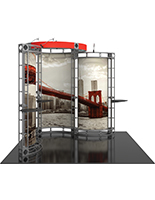 These all-in-one exhibit kits can be customized so you can be sure to stand out from the competition. 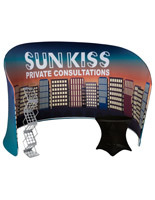 For under $2,000, what types of convention displays are available? 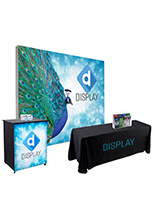 Many of our budget conscious trade show booths come built-to-order with a custom folding panel display, two TV stands, and a portable counter with 8 feet of surface space to display merchandise. 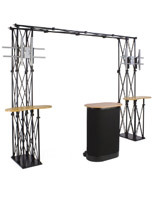 Some portable truss displays are equipped with two countertops, and the pieces are all packed securely in a case with wheels. 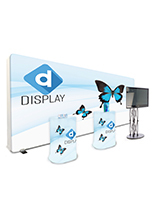 The transportable container can double as an extra surface for merchandise or mingling amongst convention attendees. This exhibit can hold up to two 60” LCD televisions. 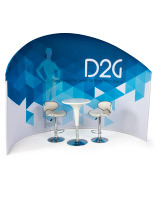 These truss displays can come with or without custom backdrops along with a literature stand if desired. 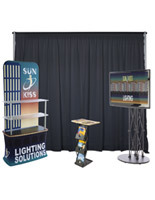 A number of pop-up exhibits with a backdrop and spotlights are available with two TV stands that hold 60” LCD televisions, a folding table, and a 24-hour custom printed table cover. 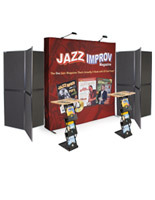 Many of our budget conscious hook-and-loop stands are combined with a custom backdrop including spotlights, and are equipped with two literature racks that double as countertops. 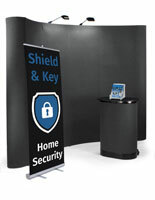 Larger hook-and-loop displays with a bigger countertop and customizable retractable banners are also available. 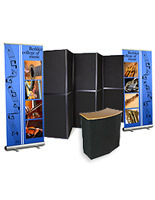 All these portable exhibits can be quickly set up and broken-down. 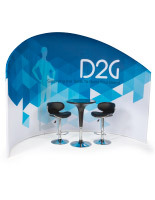 A selection of exhibits with curved custom backdrops come with a modern table and chair set. Choose from either black or white, both are height adjustable. 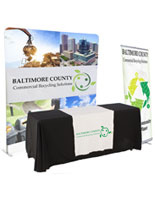 Some of our cost-friendly multi-piece exhibit sets are equipped with modern convention essentials. 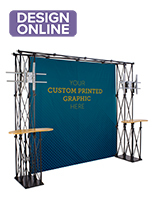 These can include an 8’ full-color custom backdrop, a 6’ stretch table cover, a convertible shipping case/counter, a twist-assembly knockdown display case with an LCD light and a floor standing locking iPad holder. 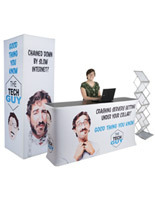 A 10' x 10' interlocking wood grain foam tile set also can be a part of the package to create a floor for your exhibit. 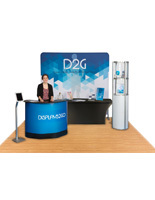 Regardless of the exhibit you choose, Displays2go provides a cost-friendly solution to creating a convention display. Staying under $2,000, each package will allow you to have a strong presence at the next event you attend. 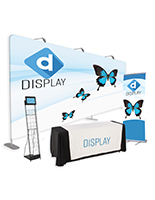 The ability to customize large backdrops, banners, and counters lets users present their brand with confidence and engage with attendees. 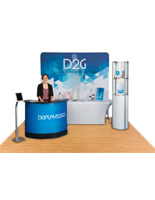 Trust Displays2go to help enhance your overall convention experience!